While many organizations have acknowledged the importance of digitally transforming their businesses and processes to deliver speed and agility, most are just starting their cloud journey. Cloud-in-a-Box delivers an enterprise cloud platform with a mix of on- and off-premises private cloud and public cloud, with orchestration between them. This will provide the organization with the ability to avoid vendor lock-in, find the optimal cloud services for a particular business or technical need, and increase redundancy. 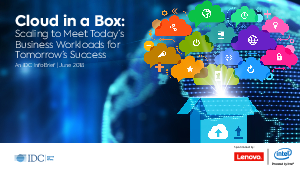 Understand how industries such as financial services, manufacturing and healthcare can benefit from “Cloud-in-a-Box” technology. Self-discovery questions and focus areas that every organization needs to go through for successful cloud deployment. Ultrabook, Celeron, Celeron Inside, Core Inside, Intel, Intel Logo, Intel Atom, Intel Atom Inside, Intel Core, Intel Inside Logo, Intel vPro, Itanium, Itanium Inside, Pentium, Pentium Inside, vPro Inside, Xeon, Xeon Phi, Xeon Inside, and Intel Optane are trademarks of Intel Corporation or its subsidiaries in the U.S. and/for other countries.